On 10 and 11 February, the think tank Global Challenge organised a workshop to discuss the report that it had produced for Mistra, the Foundation for Environmental Strategic Research. Below is an introduction to the report and the seminars that Mistra organised. I participated in the seminar, “Peak Oil Postponed”. If you wish you can listen to my presentation on YouTube (in English). “This report, from the Swedish think tank Global Challenge’s Green Economy working group, describes the results of a series of seminars initiated ahead of the UN Rio+20 conference in 2012. It provides an analytical account of the ‘green economy’ concept. What changes are required to transform our current economy into one that is sustainable, inclusive and green — and that helps to engender sustainable development? The study identifies knowledge gaps and proposes research questions. 4. How do we value Nature? 5. What do we need the financial sector for? The workshop began with eight 10-minute presentations where the speakers described how their own research areas addressed, “Key research questions for a transition to a green, inclusive economy”. The speakers were: Hunter Lovins, co-author Natural Capitalism, Cameron Hepburn, Soros Institute for New Economic Thinking, Stefano Bartolini, pioneer in research on happiness and wellbeing, Gail Tverberg, analyst and founder of Our Finite World, Paul Warde, Reader in Environmental an Economic History, University of East Anglia, Harald Sverdrup, professor of Chemical Engineering, Lunds University, Oliver Greenfield, chair Green Economy Coalition, Thomas Sterner, Professor of Environmental Economics, University of Gothenburg. It is not possible for me to describe all the views presented but Peak Oil and a little of Peak Everything were discussed from different aspects. However, more central to the presentations were the issues of economic growth and GDP that were discussed from various viewpoints. 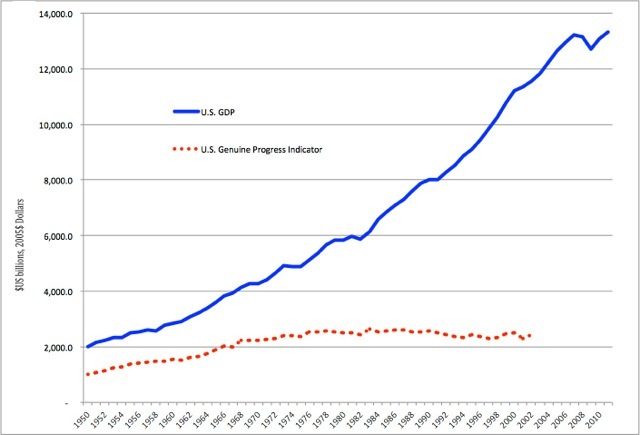 Does increased GDP make us happier? If we take the USA as an example it seems that wealth does not do so (see the figure below). 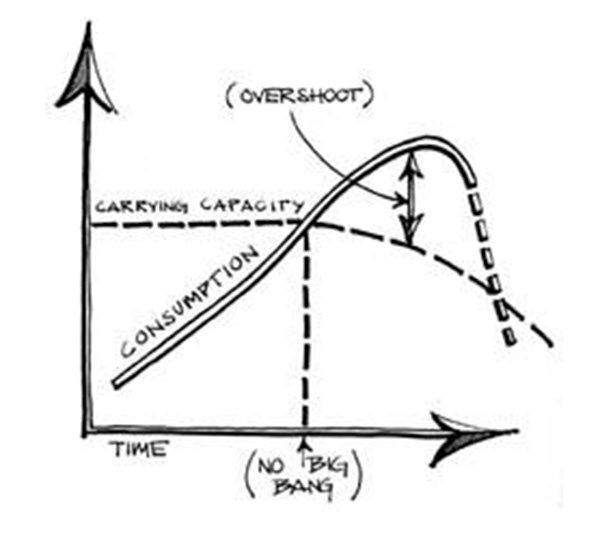 Another interesting discussion was regarding “overshoot”. Are we consuming at a rate greater than the economic system can tolerate? For oil it looks as though the costs of extracting unconventional oil are to high for a sustainable economy and that can mean that within 20-30 years – or earlier – there will be an economic collapse. There are other systems that show this behaviour. The afternoon was dedicated to group discussion. The workshop participants divided themselves up into four groups and for me it was an obvious choice to join the energy group. Tuesday morning began with Markus Zils from McKinsey & Company discussing how the price of raw materials had changed over time. From the beginning of the 1900s until approximately 2004 there was a declining trend and many economists used this to argue that there was no shortage of raw materials. However, after 2004 something remarkable happened. During approximately the past 10 years the price of resources has increased markedly until the price is now at a similar level to 100 years ago. As someone researching Peak Oil I naturally attribute this to the fact that 2004 was the year that the trend of annual increases in oil production of 1.5% broke down and we entered a production plateau – i.e. 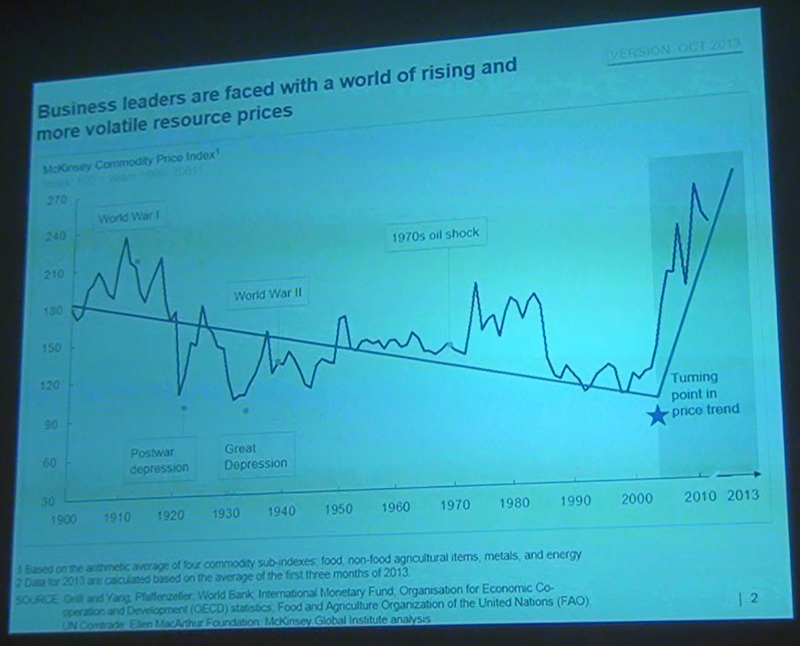 there was no increase in production and that is how we define Peak Oil. On the question of which material in Peak Everything is affected first I asserted that the raw material price and oil production behaviours described above were evidence that Peak Oil was critical and had already been reached. The fact that we now see a slight increase in oil production due to unconventional oil extraction can be an example of oil’s “overshoot” as described earlier. The goal of the group discussions was to identify important future research areas in order that we can create a green economy. The thought was that the participants in the discussion should present their own reflections and that the final report would describe a number of research areas. There were few of us who were scientists. Instead, the majority were economists interested in the idea of a green economy. Of course, I promoted research on resource availability and how future resource shortages could affect the transition to a green economy. Another important area was to find methods for communicating research results between disciplines, for example to get economists to understand that physical limits must be part of future economic models. It was argued that it is important to promote a story that the majority of people can understand. Those of you who follow my blog know of my plans to make a documentary story of oil production in Texas. I hope that this will be such a story. Now it is time to digest my impressions from this interesting workshop and then we will see whether this may be the basis for new projects. Så länge människan blir kvar i sin villfarelse att diskutera planetens och vår framtid i penningekonomiska termer finns ingen räddning eftersom vi därigenom lurar oss själva och omedvetet döljer sanningen om våra problem. Begreppet overshoot behandlas ju ingående av W. Catton i boken med samma namn och han pratar verkligen inte om detta i ekonomiska termer utan om en helt annan verklighet som gäller i naturen. Där existerar inga pengar, den enda värdemätare naturen känner till stavas exergi. Den kommer ursprungligen från solen och har under årmiljarder byggt upp det vi idag kallar biosfären. Endast växter. plankton mm. har förmåga att bygga upp sig själva direkt m h a solljus medan allt annat på planeten måste, för sin överlevnad, förbruka exergi från denna soltillverkade natur. Det gäller såväl djur (som vi själva) som allt vi själva tillverkar. Denna natur har en väldigt begränsad förmåga att försörja mer än de djur den själv skapat. Den stora extra exergiförbrukning vi genom den globala, industriella civilisationen tillfört naturen överbelastar därför kraftigt denna och följden blir vad vi kallar “miljöförstöring”. “Vårt ekonomiska system” får här rollen av maximalt själbedrägeri: allt vi människor sysslar med innebär exergiförbrukning från naturen – alltså (i dagens skala) något negativt – men blir med vår “ekonomiska terminologi” i stället något positivt; mer pengar. På detta sätt kan vi ju med rena samveten fortsätta mot undergången och utan att vi själva ens förstår det. Det bästa exemplet på vår tendens till förnekelse och magiskt tänkande visas genom vår frenetiska strävan mot ekonomisk tillväxt. Kan bara hålla med dig Robban. Staffan Delin har skrivit några likvärda böcker. Agree with Robban. As most of us would love to live in the delusion of infinite economic growth, only very few of us are thinking about the limits-to-growth. Perhaps we already missed the opportunity for converting our economy to an equilibrium state many years ago. As a pessimist, I thinking that we should be prepared at least mentally for a downhill bumpy ride lasting few decades. Is’t the overshoot reinforced by the FED:s zero interest rate policy since the tech bubble and the period after that. That’s what the film “Money For Nothing: Inside The Federal Reserve” says.